Sen. Villar listens to Diego Mag-atas Sr.
Sen. Cynthia Villar listens as OFW Diego Mag-atas, Sr. shares his stories about life in Saudi Arabia. The 53-year old worker suffers from a rare spinal ailment, and will receive free medical services courtesy of the Villar Foundation. With Christmas just around the corner, family reunions are in their planning stage, with many households looking forward to vacation trips of immediate family members from abroad. Our family will have two balikbayan guests for Christmas and my mother has her own personal countdown going on. Raymond Ople, my nephew who is based in Los Angeles City, California, has drawn up his own travel itinerary, which includes a long, leisurely drive from Manila to Pagudpud in Ilocos Norte. Through Facebook, he would send us links to blogs and websites that feature places to see, travel tips, and stuff that we can all do while in Ilocandia. It’s therapeutic to imagine how all these pieces would come together for a memorable vacation. Last week, I witnessed a different kind of homecoming. 53-year old Diego Mag-atas, Sr., an overseas Filipino worker who spent more than 30 years of his life in the Kingdom, finally came home. He left the country, hale and hearty, in his 20’s and came back, wheelchair-bound with a spinal disease that made walking without a crutch nearly impossible. Mang Diego had wanted to come home more than a year ago but had not the means to buy a one-way ticket. Saudization forced the issue as foreign workers like Mang Diego dread being caught in the deportation web. Fortunately, he was able to obtain the required exit visa from Saudi authorities before the end of the amnesty period. Saudi-based journalist Frank Resma who belongs to a non-government organization known as Patnubay in Jeddah, brought Mang Diego’s plight to the attention of the Blas F. Ople Policy Center. We, in turn, sought the help of Senator Cynthia Villar, knowing fully well her advocacy for OFWs. The Villar Foundation shouldered the tickets of Diego Mag-atas, 70-year old Rene Reposar, and several women who have their own sad stories to share about their experience as domestic workers in Saudi Arabia. This is part of the OFW repatriation program of Senator Cynthia Villar, a legacy project that was initiated by her husband, former Senate President Manny Villar. Diego’s first attempt to fly home was not successful. Last November 3, he was not allowed to board the plane because he did not have a medical certificate to show that he was fit to travel, and a travel companion that would help him throughout the long journey. These requirements were not anticipated, and for Diego, being that close to boarding that plane only to be told he couldn’t was like a punch in the gut. 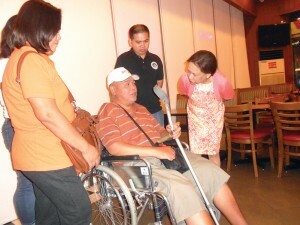 Thankfully, the Villar Foundation was able to rebook the ailing Filipino’s flight. This time around, bringing Diego Mag-atas home, became a team effort. Frank Resma of Patnubay worked on the medical certificate, the Villar Foundation handled flight arrangements, while the Philippine Consulate General specifically its Assistance to Nationals Section was able to look for the right travel companion. Diego Mag-atas arrived in Manila at 10.30 p.m. aboard Etihad Airways on November 19. His eldest son, Dennis met him at a restaurant near the airport together with Senator Cynthia Villar, niece Grace Mag-atas and sister Set Mag-atas Santos. Two doctors from the Las Pinas General Hospital were also around to check on the worker’s medical condition. After more than three decades of being away, Mang Diego is now back with his family and looking forward to spending Christmas in the Philippines. Now that is what I call a homecoming! His first priority is to spend more time with his children, while seeking medical treatment for his spinal ailment with the help of the Villar Foundation. On this first day of December, let us keep in mind those whose homecomings and reunions have been rudely and violently disrupted by typhoon Yolanda. Dear Reader, take good care of yourself and your family, and nurture the love that binds you by blood, by name, by fate.